The Folkloric Descent of the Nalón is a fun and festive sailing event that takes place along the Nalón river in the county of Laviana, in the region of Asturias. Original boats are built by the participants, who have to sail the boat along a river which has very little flow. It takes place in August in Pola de Laviana, on a Saturday between the 19th and 25th of August. This Folkloric Descent has been declared a festivity of Regional Touristic Interest. Relatives, friends and neighbours form groups and prepare thematic boats of different kinds. First of all, the day of the festival, these original floats parade along the main street of Pola de Laviana while the participants dance or act according to the theme chosen. They head towards Puente D’Arcu. Once they arrive to the Roman bridge of Puente D’Arcu, floats are turned into boats The descent itself begins here, by crossing the bridge and sailing under the arch. Just one and a half kilometres down the river is the ‘Chalana’ bridge, where the crew of each boat has to sing the Asturian Folk song “El Chalaneru”, which talks about the ‘chalana’ (a small kind of vessel), if they want to win points for the prize. The main objectives of the teams are staying afloat and arriving to the ‘Prado de la Chalana’ (finish line) with as few damages as possible. But these are no easy tasks due to the scarce flow and the rocky nature of the river, which often surprises the participants with rapids and pools. As a tradition, the main prize is “La Sopera’ (large serving pot) and the “Soperina’ for the youngest ones. It is not just the originality of the boat and its arrival to the finish line that is taken into account for choosing the winner, but also the crews’ costumes and the scenography among others. Everything began in the summer of 1968. 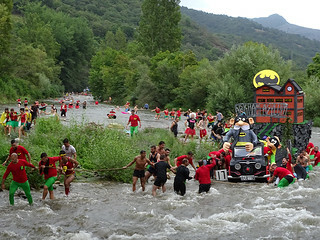 Due to the patron saint festivities of Pola de Laviana, a descent of the river was organized, with the sole purpose of living up the party at the ‘Prado de la Chalana’ where the descent ends. Twenty people participated that time. Although this event was celebrated year after year, people said it was going to disappear due to the lack of participants. But in the last decades the Folkloric Descent of the river of Nalon it is becoming more and more well-known and it is attracting more people, both participants and visitors, each year. More than 2000 people have taken part as members of the crew of one of the 40 boats registered this year. I was lucky to meet people from Pola de Laviana, who talked to me about this festival, because I had never heard about it. I was invited to take part during the descent as part of a crew, and there I was, becoming a Mexican girl during the festivity of the Day of the Dead, which was the theme of the “La Guitarra‘s boat”, one of the most outstanding and lively ones during the parade. The Folkloric Descent of the Nalon is, as far as I know, the only festival where floats become boats after the parade. And, undoubtedly, it is an attractive event for all types of public.